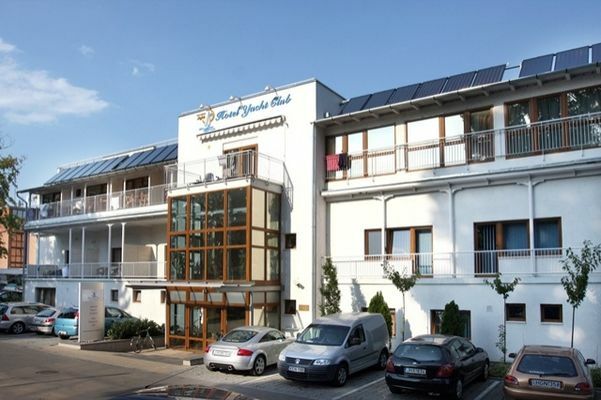 Location: Hotel Yacht Club is situated right at the lake, at the yacht port of Siófok - in quiet surroundings yet only 800m away from the town center. Siófok is rightly known as the capital of Lake Balaton. It offers ideal conditions for relaxation and recreation in the hot, sparkling summer months and in the more peaceful spring, autumn and winter months as well. Besides the town is also an ideal starting point for discovering the wonders of the Balaton region! Rooms: At Hotel Yacht Club we care about our guests in a cosy, friendly milieu combined with modern comfort. 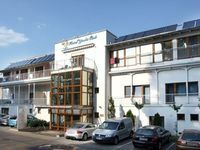 Our hotel awaits you with 29 rooms that are all air-conditioned and replete with a shower, Tv, telefon, Internet-connection, minibar. Besides single and double rooms we can also offer suites/family rooms with a bedroom, a bathroom and a separate living room. Services: Enjoy a nice dinner at our restaurant along with a great view of the resting yachts in the port. At the non stop bar we offer a great variety of drinks, cocktails, coffee and tea. Further services: WiFi Internet in the lobby and club room (free of charge), safe at the reception, billiard. Wellness: Our lakeside spa cares about your body and soul throughout the whole year with services like indoor swimming pool (25m) with spa elements, children pool, indoor whirlpool, steam bath and saunas, massages, solarium, sunbathing terrace. Discover the thousand faces of Lake Balaton while relaxing at our spa! We also ensure our guests free entry to the beach nearby (50m). Thinking of the little ones too: At our hotel children under 6 years may stay free of charge in the same room with their parents. When requested, we also ensure baby cot free of charge. At our restaurant child chair and children menus, at the beach playground and paddling pool are waiting for the little ones. Board games and playing card are to rent free of charge. Siófok and surroundings of Lake Balaton offer many further possibilities for relaxation, sport, entertainment and recreation throughout the whole year: newly opened thermal bath and spa, shipping, wine- and spirit tasting, horse riding, carriage tours, quad, paintball, gokart, castles and forts, Balaton Uplands National Park, spas and thermal bathes, etc. Regarding these we will do everything to give you as many information and help, as possible - please, feel free to ask us! Trainings, meetings, seminars: Hotel Yacht Club offers ideal conditions primarily for smaller events, meetings, trainings, seminars. In our renovated hotel we ensure the necessary rooms (till 60 and 40 persons), technical equipment, catering and recreation in warm, friendly and undisturbed milieu. Our seminar rooms have Internet-connection, are naturally lightened and air-conditioned. • Half board is available at 4200 HUF per person. • Full board is available at 8400 HUF per person. Air-conditioned and replete with a Tv, telefon, Internet-connection, minibar. One single room does not have a balcony, it is located on the ground floor. The window overlooks the street, the bathroom has a shower. The floor space is 14sqm. All are air-conditioned and replete with a Tv, telefon, Internet-connection, minibar. Two of these rooms have a bathtube is the bathroom, the others have shower. These double rooms can be requested with double- or twin arrangement and have a balcony, some can accommodate an extra bed. The roomsize varies between 18 and 23 m2. The apartments include a bedroom (with a double bed or two single beds), a living room and a bathroom with shower. These rooms are also ideal for families, since in the living room on a pull-out sofa two children or one adult can sleep comfortably. In case of a bigger family, a further extra bed can be put in the room. Only one of the apartements doesn't have a balcony. The size of the apartments is 25-32 m2.